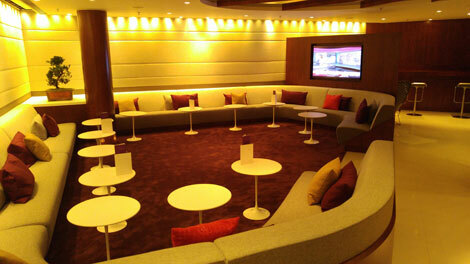 Virgin Atlantic Clubhouse has unveiled its new look at Hong Kong International Airport after six weeks of renovation. 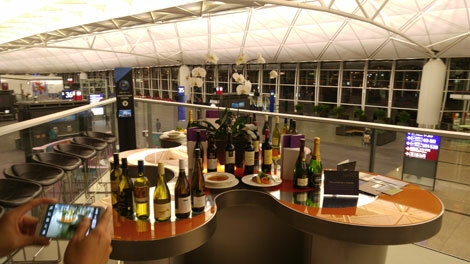 Business Traveller Asia-Pacific enjoyed a tour of the revamped lounge, located near gate 36 on level 7 in Terminal 1. Upon entering the lounge area, a stand-alone business centre is immediately on your right. 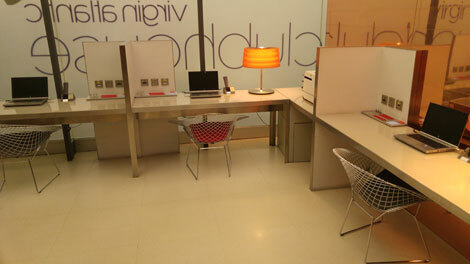 There are three individual work spaces, each equipped with a laptop, phone, table lamp, pen and paper. There is also a photocopier and fax machine. The moderate-sized lounge is found at the end of a long corridor with seating for up to 110. It has a modern design, with neutral tones and dark wood. Lots of ambient lighting helps to make up for the absence of windows, although those who enjoy views of the airfield may be disappointed. Bar stools line the brightly lit counter in the middle of the room, where a choice of 17 cocktails are on offer, alongside a normal drinks menu. Table service is also available at individual seating areas. A highlight is the “TV area”: a big social space set with long sofas and small tables. The Clubhouse manager explained this was an ideal place for guests to watch major sports events with their fellow passengers, such as the recent Wimbledon tennis tournament. Alternatively, for guests seeking privacy, there is also a small area with four seats at the back of the TV area. There is a shower room, with adequate space for guests to take a shower or change clothes, though it is not especially roomy. The “outside” space has been designed with a garden feel, with tables divided by large plants to create an air of privacy. An “amoeba table” is located on the open balcony, another social space for guests to share a bottle of wine. The Clubhouse provides an all-day a la carte menu of complimentary food items. There are four choices for starters. The homemade soup of the day (lentil when we went) is a good choice to trigger your appetite. Other options include sliced smoked salmon and warm potato rosti (a bit plain when not paired with the sour cream and watercress dressing) or my personal favourite, the rare roast beef Asian salad – which was perfectly complemented by the toasted sesame seeds and soy dressing. Main courses include a giant Clubhouse burger – even sampling a quarter I couldn’t fit the whole thing into my mouth, but what I could fit in was delicious with the beef cooked to a perfect medium. 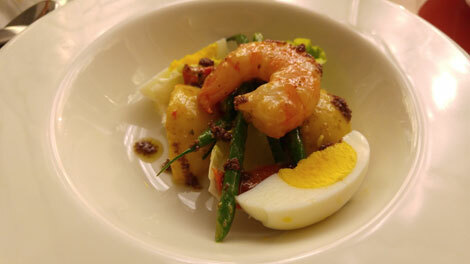 However, the king prawn nicoise was my favourite. 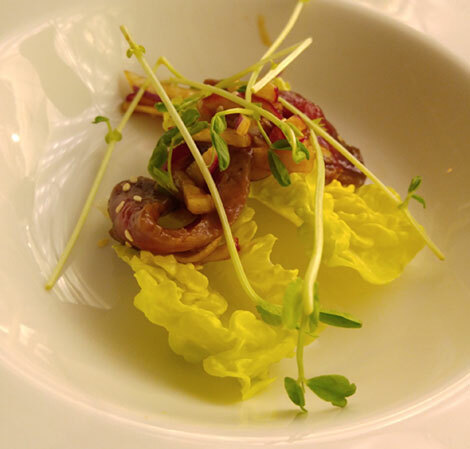 The prawns were again perfectly cooked, and the tapenade dressing brought out the freshness of the seafood. The grilled chicken breast was unsurprising, but fair enough. 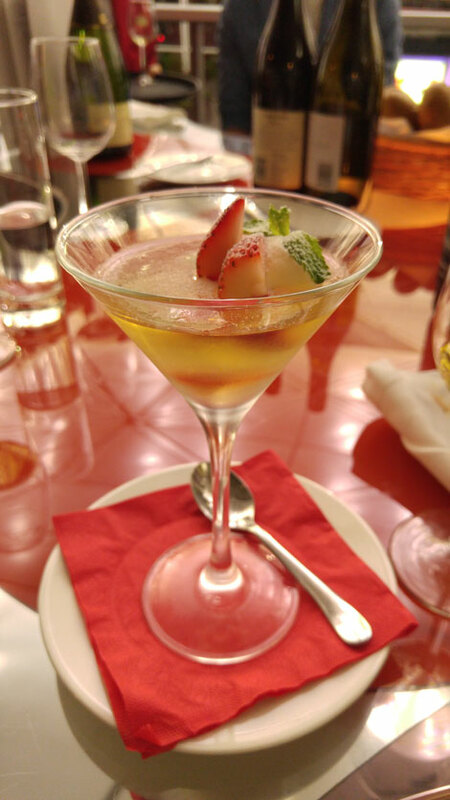 For dessert, I would recommend the signature dish – champagne and strawberry jelly. The creative combination balanced the sweetness with the delicate champagne. It is a wonderful, must-try dish. 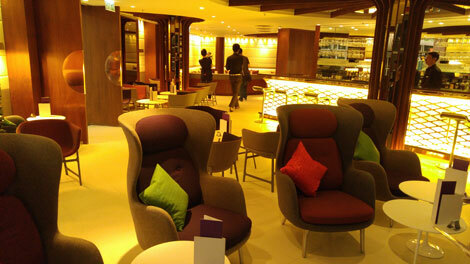 The lounge is open from 0600 to 2300, reserved for Upper class passengers and the carrier’s Flying Club Gold members.